Imaikkaa Nodigal is a edgy thriller that keeps you engrossed for most part of the movie. A cat and mouse game that has got best performances from the leading actors. Nayantara has carried the whole movie and Anurag Kashyap has given a stellar performance. Technically sound, the movie could have been edited better considering the duration. 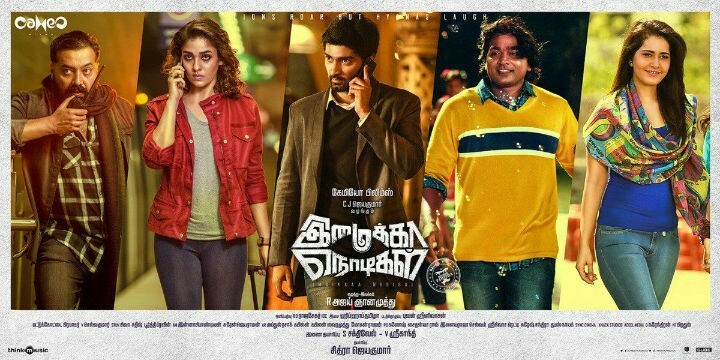 Nayantara who is fresh from the success of ‘Kolamavu Kokila‘ is now back again with ‘Imaikka Nodigal‘. Kollywood seems to be bitten by the thriller bug and Imaikaa Nodigal is one among them. However, it’s not just another attempt as the movie has its own twists and thrills. The movie runs for nearly 3 hours and even then the plot kicks off right from the first frame. There are no spoon feeding moments or character development scenes. The movie starts where a Psycho killer kills off the people on the list. The female protagonist Anjali (Nayantara) is a CBI officer and she is on a serious mission. We never know any plans for her mission, but that sets up the tone of the movie. The cat and mouse game between Anjali and the Psycho Killer set up the game. And at one stage, Anjali realizes why the Psycho Killer is after her and her family. Slowly, the love story between Anjali’s brother Arjun (Atharvaa) and Kritika becomes a turning point to the case. How Anjali comes out of the mess? How she captures the Psycho killer forms the rest of the story. Nayantara as a brainy CBI officer portrays a contrasting character to her ‘Coco’. She carries the whole movie on her shoulders. Anurag Kashyap as the menacing killer has given one of his best performances and he is the perfect fit for such a role. Vijay Sethupathi makes an impact even in his small screen space. Technically the movie is rich. Rajasekar’s cinematography elevates the dark tone and keeps the tense. Hip Hop Tamizha music comes to the aid during the gripping tense moments. However, editing should’ve been better as 3 hours test the patience of the audience. The best part of the movie is the director kept the twists unpredictable until the end. Overall, a Perfect cat and mouse game which you shouldn’t miss!